Hello! 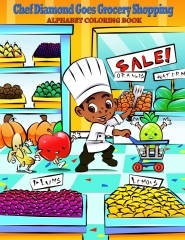 My name is Diamond McNulty and I’m a Executive Chef and children’s book author. I wrote my first book, How To Become A Successful Young Man, when I graduated from college. One of my many passions are mentoring and helping kids become successful. After that, I started multiple business ventures which allowed me to complete my goals. I was featured on ABC 7 News Chicago for my Entrepreneurial Endeavors. Check out my newest books: Chef Diamond Goes Grocery Shopping and How To Become A Successful Woman. I’d love to hear from you, so please write to me at diamondmcnulty.com I’m available for kids’ cooking classes, classroom visits, TV appearances, book packages, and more.